The Prinz Eugen (fourth warship to wear that name) was the third and last heavy cruiser commissioned by the Kriegsmarine. She acquired notoriety on her first war mission in May 1941, during the Atlantic sortie with the Bismarck in which the Hood was sunk and the Prince of Wales damaged. In February 1942, after a period spent in Brest, the Prinz Eugen together with the battleships Scharnhorst and Gneisenau, successfully passed through the English Channel on her way back to Germany. Shortly afterwards, while en route to Norway she was torpedoed and damaged by a British submarine off Trondheim. The ship was not ready for service until the beginning of 1943, and then used for training purposes in the Baltic. In 1944-1945, the Prinz Eugen was used for shore bombardment off the Baltic coast against the advancing Soviet troops to cover the evacuation of refugees. The ship finally surrendered to the British at Copenhagen in May 1945, and was then handed over to the Americans. In July 1946, she survived two nuclear tests in Bikini Atoll. Towed later to Kwajalein Atoll, the Prinz capsized on 22 December 1946. 16 November 1935: Building contract placed. 23 April 1936: Lay down at the Germania shipyards in Kiel. Construction number G 564. 22 August 1938: Launched. Christened by Frau Magda von Horthy, wife of the Hungarian Regent. 02 July 1940: Hit by a bomb during a British air raid on Kiel. Damage is slight. 01 August 1940: Commissioned under Captain Helmuth Brinkmann. 08 April 1941: Departs Kiel for Gotenhafen. 10 April 1941: Arrives in Gotenhafen. 14 April 1941: Performs measured mile runs off Neukrug achieving a top speed of 32.837 knots. 15-16 April 1941: Conducts exercises with the 24th U-boat Flotilla. 17-18 April 1941: Conducts exercises with the battleship Bismarck. 23 April 1941: Damaged by a magnetic mine while en route to Kiel. 24 April-02 May 1941: Drydocked for repairs at Deutsche Werke Kiel (Dock C). 12 May 1941: Departs Kiel for Gotenhafen. 13 May 1941: Arrives in Gotenhafen. In the evening, conducts a refuelling exercise at sea with the Bismarck. 18 May 1941: Operation Rheinübung. Departs Gotenhafen in the evening to attack the British supply lines in the Atlantic with the battleship Bismarck. 20 May 1941: At 1300, is sighted with Bismarck by the Swedish cruiser Gotland in the Kattegat. 21 May 1941: In the morning, enters the Korsfjord near Bergen with Bismarck and destroyers Z10, Z16, Z23, and anchors in the Kalvanes Bay. Refuels from tanker Wollin, and leaves the Norwegian fjord at night. 23 May 1941: At 1922 is sighted with Bismarck by the British heavy cruiser Suffolk in the Denmark Strait. 24 May 1941: Between 0555 and 0609, together with Bismarck engages the battle cruiser Hood and the battleship Prince of Wales. Obtains at least one hit on Hood before the mighty British battle cruiser is sunk by Bismarck at 0601. Afterwards obtains three hits on Prince of Wales. Expends 179 x 20.3 cm and 66 x 10.5 cm projectiles and remains herself undamaged. At 1814, in the afternoon leaves Bismarck and heads south. 26 May 1941: Refuels at sea from tanker Spichern. 01 June 1941: Enters Brest. 02 July 1941: Hit by a bomb in Brest. 60 dead. 11-13 February 1942: Operation Cerberus. The Prinz Eugen leaves Brest with the battleships Scharnhorst and Gneisenau escorted by six destroyers for a dash through the English Channel. Group commanded by Vizeadmiral Otto Ciliax. She expends over 5,000 rounds of AA ammunition, and fires some 20.3cm shells at British destroyers. Prinz Eugen reaches Brunsbüttel undamaged in the morning of the 13th, then navigates the lock of the Kiel Canal, and makes fast in the north chamber. Passing through the English Channel at 30 knots. February 1942. 21 February 1942: Operation Sportpalast. The Prinz Eugen, as flagship with the C-in-C of Battleships (Vizeadmiral Otto Ciliax) on board, departs Brunsbüttel for Norway together with the heavy cruiser Admiral Scheer and destroyers Richard Beitzen, Paul Jacobi, Hermann Schoemann, Friedrich Ihn, and Z25. 22 February 1942: At about 1300 hours, Prinz Eugen and Admiral Scheer anchor in the Grimstadfjord near Bergen. The ships weigh anchor at 2040 in the evening. 23 February 1942: At 0704 hours, the British submarine Trident (Commander G. M. Sladen) scores a torpedo hit on Prinz Eugen's stern off Trondheim (quadrant AF 8263). The damage is severe, the rudder is lost, and 50 men lose their lives, but she manages to reach Trondheim by her own power and join the Tirpitz and Admiral Scheer. At 2357 hours, anchors in the Lofjord a branch of the bigger Åsenfjord near Trondheim. February-May 1942: The ship undergoes temporary repairs carried out by the repair ship Huascaran in the Lofjord. Two jury-rudders are installed on to the stern transverse bulkhead. 17-18 May 1942: Operation Zauberflöte. Escorted by destroyers Paul Jacobi, Z25 and torpedo boats T11, T12, the Prinz Eugen leaves Trondheim and returns to Kiel for final repairs. On the way back home the German flotilla is attacked by British Beaufort torpedo bombers off the Norwegian coast, but repels the attack and escapes undamaged, reaching Kiel in the evening of the 18th. 23 May 1942: Drydocked for repairs at Deutsche Werke Kiel (Dock V). 08 September 1942: Captain Hans-Erich Voß assumes command of the Prinz Eugen. Mid-October 1942: Repair work finished. Subsequently leaves Kiel for the Baltic. 28 October 1942: Arrives in Gotenhafen. 09 January 1943: Operation Fronttheater. Leaves Gotenhafen bound for Norway together with the battleship Scharnhorst and destroyers Paul Jacobi, Friedrich Ihn, and Z24, all under the command of Admiral Otto Schniewind. Detected by British planes off Skagen on the 11th, the group returns to Gotenhafen where it arrives on the 12th. 23 January 1943: Operation Domino. Sails for Norway again with Scharnhorst but is detected one more time by British planes and returns to the Baltic. 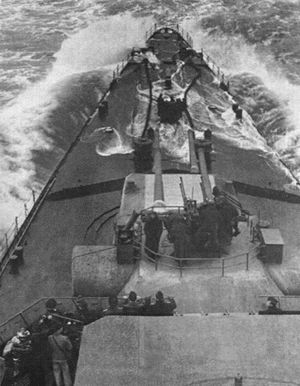 29 February 1943: Captain Werner Ehrhardt takes over command of the Prinz Eugen from Captain Voß. March 1943-1944: Used as a training ship in the Baltic. 05 January 1944: Captain Hans-Jürgen Reinicke takes over command of the Prinz Eugen from Captain Ehrhardt. 19-28 June 1944: Sortie to the Gulf of Finland. 19 August 1944: At 0700 hours, Prinz Eugen departs Gotenhafen for the Gulf of Riga, together with torpedo boats T23 and T28 of the 2nd Flotilla. 2nd Battle Group under command of Vizeadmiral August Thiele. 20 August 1944: Shore bombardment against the Soviets on Tuckum in the Gulf of Riga. All three ship-borne Arado seaplanes are used to observe the fall of shot. Prinz Eugen fires 240 projectiles on Tuckum. 21 August 1944: Arrives in Gotenhafen. 20-25 September 1944: Escorts a convoy retreating from Finland. 10-15 October 1944: Prinz Eugen, flying the flag of Vizeadmiral August Thiele, together with Lützow, three destroyers, and four torpedo boats carry out support operations off the coast of Memel against the advancing Soviet armies. During this period, the Prinz Eugen fires 1,196 rounds of ammunition at Memel. 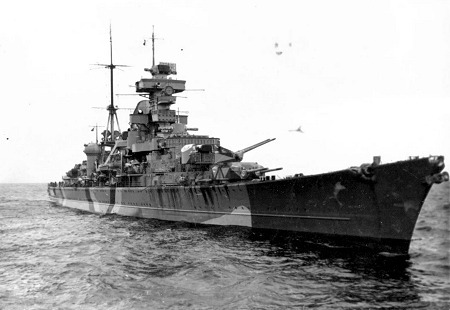 15 October 1944: At 2004 hours off the coast of Hela, the Prinz Eugen rams the light cruiser Leipzig amidships. It takes fourteen hours to separate both ships. 13 November 1944: After two weeks in dock at Gotenhafen, repair work is finished and the ship is ready again for action. 21-22 November 1944: Engaged in shore bombarment operations against Soviet positions in the Sworbe peninsula on the island of Ösel. Prinz Eugen fires a total of 514 rounds of ammunition at Sworbe. December 1944: Main 20.3 cm inner gun tubes refitted in Gotenhafen. End of January 1945: The Prinz Eugen is ordered to the coast of Samland, north of Könisgberg, to provide support and cover the evacuation of refugees. From 29-31 January the Prinz expends 871 rounds of 20.3 cm ammunition against the Samland coast. 10 March - 04 April 1945: Prinz Eugen is engaged in shore bombardment operations against Russian troops off the Gulf of Danzig. The ship fires on land targets around Tiegenhoff, Ladekopp, Zoppot and Danzig. On the 26th, one crewman is killed by machine-gun fire from Russian aircraft. On the 31st, nine men are killed as a result of a hit from a Russian rocket bomb. In twenty-six days the ship has expended 4,871 rounds of 20.3 cm ammunition, and 2,644 rounds of 10.5 cm ammunition. 10 April 1945: After expending all her ammunition, the Prinz Eugen leaves the Baltic for Copenhagen where she arrives on the 20th. 07 May 1945: At 1600 hours, the battle flag is lowered and the ship surrenders in Copenhagen with the light cruiser Nürnberg. 08 May 1945: The Prinz Eugen is handed over to the British. 26 May 1945: Leaves Copenhagen with Nürnberg, and sails to Wilhelmshaven escorted by British cruisers Dido and Devonshire arriving on the 28th. Once in Wilhelmshaven enters dry dock. 05 January 1946: The American flag is hoisted and the ship put into service in the US Navy as USS Prinz Eugen (IX-300). 13 January 1946: Leaves for Boston with a mixed crew of Germans and Americans. 22 January 1946: Arrives in Boston. Shortly after moves to Philadelphia where the barrels of turret "Anton" are removed. March 1946: Leaves for the Pacific through the Panama Canal. 01 May 1946: In San Diego, the last German crew members leave the ship. Dispatched to Bikini Atoll in the Marshalls. 01 July 1946: A-bomb test Able. At 0900, a nuclear bomb dropped over a target fleet of ships by a B-29 detonates at 518 feet above the surface. Prinz Eugen is located 1,194 yards from the point of explosion and survives the test undamaged. 25 July 1946: A-bomb test Baker. At 0835, and nuclear bomb is detonated underwater at a depth of about 90 feet. 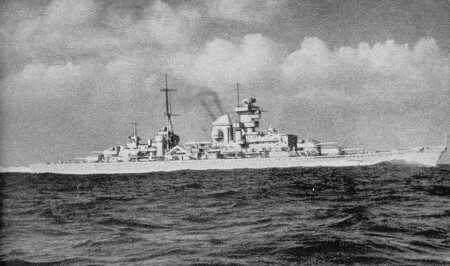 Prinz Eugen is located 1,990 yards from the explosion, and again survives the test with no appreciable damage. Early September 1946: Towed to Kwajalein Atoll. 22 December 1946: Due to leaks takes a 35º starboard list and capsizes over Enubuj reef in position 08º 45' 08" North, 167º 40' 59" East (see the map below). 1978: By initiative of former crew members, and after seeking for permission, the 12 ton port propeller is removed from the hull and shipped to Germany where it is erected as a naval memorial near Kiel. The Prinz Eugen in May 1941 (up), during the Channel Dash in February 1942 (center), and in 1945 (lower). 01 August 1940- 04 August 1942: Kapitän zur See Helmuth Brinkmann. June 1942: Fregattenkapitän Karl-Heinz Neubauer. August-September 1942: Korvettenkapitän Wilhelm Beck. 08 September 1942- 28 February 1943: Kapitän zur See Hans-Erich Voß. 29 February 1943 - 05 January 1944: Kapitän zur See Werner Ehrhardt. 05 January 1944 - 07 May 1945: Kapitän zur See Hans-Jürgen Reinicke. 1946: Captain A.H. Graubart (USN). Displacement: standard 14,240 mt, full load 19,042 mt. Dimensions: overall length 212.5 m, beam 21.7 m, maximum draft 7.2 m, height 12.45 m.
• 8 x 20.3cm SK C/34 guns in four double turrets. • 12 x 10.5cm SK C/33 guns in six double mounts. • 12 x 3.7cm SK C/30 guns in six double mounts. • 12 x 53.3cm torpedo tubes in four triple mounts. • 2 x triple depth charge racks. Fire control: 5 x 7-m base rangefinders. • In 1941: 2 x FuMO 27. • In 1945: 1 x FuMO 26, 1 x FuMO 81 "Berlin", 1 x FuMO 25, 1 x FuMO 27. Propulsion plant: 12 boilers, three Germania turbine sets, 132,000 hp. One rudder.